Cats, particularly the older ones are susceptible to kidney diseases. About 30% of the aged domestic cats suffer from kidney diseases – either acute or chronic. Here is a quick guide to the how and why of kidney disease in cats. Early detection is the key to control and successful treatment of kidney disease in cats. 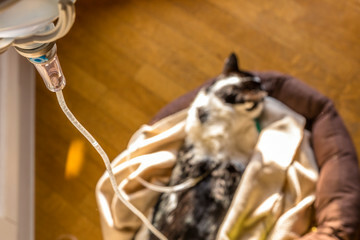 Some of the early signs of a kidney disease in cats are – increased thirst, large clumps of litter, increased urination, weight loss, loss of appetite, nausea and vomiting. Other symptoms to watch out for are – lethargy, drowsiness, unkempt appearance, pale gums (anemia), bad breath due to oral ulcers. When you have noticed these early symptoms in your aged cat, it is time to consult your veterinarian. The vet may run tests to screen for the most common kidney conditions that may lead to kidney damage. Some of them are kidney infection, kidney stones, disease of kidney tubules, glomerulonephritis, cancer and polycystic kidney disease. Physical Examination: The first line of diagnosis is always a thorough physical examination that involves observing the body temperature, abdominal palpitation, renal asymmetry, painful kidneys and evidence of high blood pressure. Laboratory Tests: if initial physical examination indicates symptoms of kidney malfunction, lab tests are performed including Complete blood picture, urinalysis, urine culture, protein to creatinine profile, imaging and biopsy. Treatments include medications to prevent protein loss, anemia and enzyme inhibitors. If blockages are found then a surgery may be suggested along with intake of IV fluids. Diet restrictions such as low salt and phosphorous intake, and moderate protein intake are advised.